Methods of Knowledge in Western Thought. How to Reach Higher and Higher Forms of Inner Perception? Intuition is the immediate knowledge of the Absolute, obtained through the eye of wisdom, as opposed to the knowledge of the external objects derived through the exercise of the senses and the intellect. 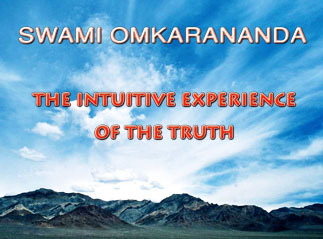 It is truth obtained by internal apprehension, without the aid of perception or the operation of the reasoning powers. It is a direct vision and apprehension of the divine Reality underlying the manifested and the unmanifested universe. In intuition, which is knowledge springing from within, first there is the experience of the flash of gnostic light. Thereupon the aspirant is established in his own inner Self. As intuition is a direct supramental knowledge of the Self in the immediacy of spiritual realization, there is no process of reasoning, no functioning of intellect, no experience of sensation, here. This is an inner spiritual experience which cannot be adequately described in words. Words are merely conventional. Being imperfect, language cannot express this whole, ineffable, transcendental experience. The mind and the senses require time and space to function, but the Reality which is beyond this temporal, spatial and causal order of things, can only be grasped and apprehended by intuition. Intuition is beyond relativity. The knowledge of the Divine would have been lost to mankind but for the intuition and revelation of the seers and sages. The sage in his flights of intuition, ascends to that supramental region where he experiences the divine Reality or the Absolute; and this superconscious experience is, in its nature, very vivid, vital and vibrant. Grand, sublime and profound is this intuitive Experience-Whole. It is intensely real to the sage. The medium of truth-discernment, or philosophical knowledge, has been different in the different ages. Philosophical knowledge has imbibed varying degrees of certitude from the organ of knowledge employed in each age. This is the first principle. The second principle is derived from the progress of methodology. The system into which philosophical knowledge has been organised, derives much from the method employed in the particular period of philosophical advance. An analysis of these two principles will help us to understand the limits and values of the philosophical systems of the West. Relative knowledge can be derived from various organs of knowledge. It depends upon the individual's peculiar development, determined by his social environment, or natural capacity. History records that the early European practised magic and necromancy. Demonology up to the time of Elizabeth was, in certain quarters, a popular science. Witches and witchcraft were taken serious notice of by the state-laws of European countries right up to the Renaissance. Early European philosophy was hylozoistic. The fact was that the early European had, unwittingly, developed an instinct for knowing and doing things in a mysterious manner. This he called magic. The pursuit of magic was more or less universal, though, no doubt, a great majority of these people must never have risen above the plane of superstition. Most of them must have failed as magicians. It is because they failed to tap the hidden resources of their instincts. But that a few succeeded, is sufficient to record the possibilities of deriving knowledge from instinct. In India, China, Tibet and other Eastern countries, there still are seen individuals who can demonstrate magic up to the performance of the rope-trick. These people develop in themselves their occult powers by accidental exercise of will. Theirs, too, is a standard very much pragmatic rather than causal, or explanatory. He whose occult instinct worked became a successful magician. The question of "why and how" never arose in their minds. From the philosophical viewpoint, it is enough to say that the occult instinct yielded useful knowledge within the limits of error and harm. And, moreover, such knowledge was very narrow, totally unsystematic, unmethodical, scrappy and fantastic. Intensely developed faith also yields useful results. The era of vigorous Christianity in Europe banked upon faith. The Christian saints and divines - all Catholics - performed miracles from faith in Christ. Faith yielded the highest knowledge to some of them. St. Paul became an apostle by the sterling quality of his faith. The history of European philosophy in the medieval ages has a strong current of faith running in its stream. The Hebraic and Islamic philosophies emphasise faith exclusively. The core of faith is feeling. Feeling, being more universal, made knowledge based upon faith more popular. In European philosophy, the vehicle of faith was authority and deductive reasoning. Right up to the modern period, whatever mass of knowledge, authority and syllogistic reasoning there was, was cherished almost as religion. That is why there were schools of thought with their ardent adherents. But faith, too, has its limitations. In most cases faith failed to fulfil pragmatic demands made upon it by the professors. It, however, compensated for its deficiencies by inspiring poetry, aesthetic undertakings, and the heroic self-sacrifice in the cause of the good and the beautiful, the moral and the holy. With the rise of the scientific spirit in Bacon, reason was adopted as the organ of knowledge. Previous philosophy was either rejected, or subjected to rational analysis de novo, in order to be regarded as standard knowledge. The utilitarian and pragmatic significance of scraps of knowledge, was rejected in favour of causal explanation of relations subsisting among facts. Whether the results were useless or useful, mattered little. What mattered was that they showed truth of coherence and correspondence with facts, and lent themselves to universal verification and causal explanation. Rational knowledge has produced wonderful systems of thought, but the instrument of reason has been found to be very feeble and full of limitations. Hence, rational knowledge has its limitations of relativity and error. But it has certainly widened the boundaries of knowledge, yielded by instinct and faith. It possesses a greater degree of certitude than do the products of instinct and faith. Still, reason as the instrument of knowledge is totally incompetent to comprehend the ultimates. Recently, after the rise of psychoanalysis, unreason, or instinct, is again coming into favour as an instrument of knowledge. Bergson died without having been able to make intuition the functioning organ of knowledge. This brief survey of European competency for obtaining knowledge, induces one to believe that relative knowledge can be derived through the instrumentality of more than one medium. It depends upon what [it is that] your will lays the emphasis to know. Your success in exercising your will to know depends, for the accuracy of the results, upon the character of your receptive attitude. If it is highly self-critical and self-examining, you will never be satisfied with relative and limited knowledge yielded by a defective organ of knowledge. If it is credulous and self-complacent, you will remain poetically intoxicated with fancies, fantasies, falsehoods and half-truths. The problem, therefore, as it formulates itself, is this: what is the most perfect organ of knowledge? How can it be achieved? What are the deliverances of this organ of knowledge? As regards method, the European thinkers started with analogy as their favourite method of philosophising. The early European philosophers took hints from such objective entities as water and fire. Upon the analogy of these they philosophised. Analogy remained, to gain a great share of the attention of even very good thinkers, - even when the dogmatic method of deductive logic found favour with the philosophers. The universal premises passed unquestioned, as they were the word of authority. - Authority may have been built upon analogy. This continued, until Bacon introduced his inductive method in science. Since then, philosophy has tried analysis as well as synthesis, induction, deduction and dialectics. Since the rise of the scientific method, philosophy, too, has adopted it in toto. Lately, tendencies are visible of introspection, dream analysis, auto-suggestion, automatic writing, hypnotism, free association, and psychological experimentation, being included in the scientific method of present-day philosophy. The question must be asked as to what is the final method that can be relied upon with absolute certainty in investigating the truth of philosophy? The leading philosophers of the modern era have laboured to solve the problems of method, and of the organ of knowledge, in their own individual ways. Intuition is the only method of an approach to, and the experience of, the divine Reality. The ultimate source of all proofs is direct apprehension. Neither the scriptures, nor the spiritual souls, can externally offer us the intimate knowledge and experience of the Reality, which must come only through an act of the inner Self in us, that sees Itself when the mind is undisturbed, unprejudiced, silenced, made calm and pure. Intuition is the only way by which the Absolute can be realized and experienced in all its totality and integrity. The mortal, finite, limited senses and the intellect, cannot comprehend the Reality which is immortal and all-pervading. The indwelling Soul of this material universe is pure Consciousness, which, in all its integrity, the seers have intuited; and they have given to mankind the rich and precious Wisdom of the Self. The realization of God is possible only through intuition. It is in intuition that everything becomes clear, all doubts vanish in toto. In contrast to mediate knowledge, intuition is immediate knowledge, direct and integral. Through intuition, the aspirant perceives the truth of things without the aid of reasoning or analysis. Truth or Brahman is inconceivable, beyond the powers of reason, and consequently, unarguable. Therefore, the Kathopanishad declares, "This knowledge is not to be obtained by argument, but it is easy to understand it when taught by a teacher who beholds no difference"; "The sages, with their body, senses and mind tranquil, realise that Truth; but when it is overwhelmed with dry reasoning, it vanishes". Immediate intuitive experience is the criterion of truth, for the sages. The mood of the modern age makes the sense-perception the only test of truth. The age of ancient philosophy was an age of intuitional perception, an age in which intuitional experience was the guarantee of Truth. The modern period is an age of the questioning, critical and analytical spirit, an age in which the guarantee of truth is the test of sense-perception. Anything which one can perceive through one's sense-organs is accepted as the reality, and everything which the senses cannot perceive is rejected as unreliable. Thus, many a precious factor of the ancient world cultural heritage has been rejected, and set aside as superstition. Modern mind must come to realise that, in fact, intuition and intuitive discernment form the only true touchstone of philosophy. Ultimately, the method of intuition is the only method of discerning the Truth. Without developing intuition, the intellectual remains imperfect and blind to the Truth behind the appearances. In the light of the developed intuition, all other philosophies seem to be nothing more than so many systems built on interesting table-talks, funny essays, humorous attempts in the game called "blindman's buff"! Unlike reason, intuition is that power in the higher reaches of mind which perceives the truth of things in the immediacy of experience; it is a directly apprehending power of Consciousness. Dispensing with the process of reasoning and deduction, excluding mediate knowledge, intuition brings us a knowledge which is non-inferential, non-sensuous, immediate, intimate and direct. While reason conceptually constructs knowledge, intuition apprehends in immediacy the essence of things. Reason studies the superficies of the objects of knowledge, analyses and categorises the external nature of things; intuition experiences the very heart and truth of things. While reason reasons about things, speaks to us of things as they appear, intuitive knowledge grasps and experiences the very life of things, brings us an awareness of the things as they are in themselves, in their essential nature. Intuition bestows full transcendental wisdom; intellect confers the knowledge of external objects. Intuition is infallible; intellect guesses, believes, desires. Intuition is a flash and an illumination; intellect is involved in a struggle with glimmerings of knowledge. Intuition in time becomes eternity, intuition in space becomes infinity; in intellect, there are the distinctions of past, present and future, space and the three dimensions length, breadth and height. The conclusions of reasoning can never be uniform; hence, reason has no sure basis. Being what it is in its strength, reason cannot upset the conclusions of dynamic spiritual philosophy which are founded on the infallible and authoritative wisdom of transcendental experience. What one person establishes through the exercise of reason, can be refuted by another more intelligent and ingenious. Even a sage of exceptional natural powers is refuted by other sages of equal, or greater, intellectual calibre. What one logician endeavours to establish as perfect knowledge, is demolished by another who, in his turn, is treated alike by a third. How, therefore, can knowledge which is founded on reasoning, and whose object is not something permanently uniform, be perfect knowledge? The mark of uniformity is characteristic of perfection in knowledge. Any thing that is permanently of one and the same nature, is acknowledged to be a true, or real, thing. Knowledge of the Truth, or Self-knowledge, is termed perfect or true knowledge. In the case of perfect knowledge a mental conflict of men's opinions is not possible. But these cognitions or knowledge founded on reasoning, do conflict. Once again, how can knowledge which is founded on reasoning, and whose object is not something permanently uniform, be perfect knowledge? Logic has no fixity, or finality. Owing to the difference of the brains of men, their reasoning powers are also different. The deductions of one reasoner are overthrown by another. We see how arguments which some clever men had cogitated with great pains are shown by people still more ingenious, to be fallacious; and how the arguments of the latter again are refuted, in their turn, by yet others. Hence, it is impossible to accept mere reasoning as having a sure foundation, on account of the diversity of men's opinions. Even if there is to be any finality of reasoning, it will not bring about any finality of doctrine in regard to the Soul, or the Truth, because the Soul or the Truth cannot be experienced by the senses, and neither analogy nor syllogism can apply to it. The intellect is finite and frail, conditioned in time, space and causation; it cannot know things which are transcendental. Intellect cannot work when there is delirium, fear, disease, or the influence of some intoxication. In matters transcendental, such as the existence of the divine Reality, of an afterlife, of final release, and so on, the pronouncements of human intellect can never be perfectly free from doubt, because these are matters not within the scope of intellect. They stand beyond its scope. Though intuition transcends reason, it is not opposed to reason. Reason can give us only conceptual knowledge, and conceptual knowledge does not present us the knowledge of the Reality in its entirety; it divides, fragments and breaks things into pieces. Since the intellect which is the seat of logical conclusions, functions on the wrong basis of the assumption that the results achieved by the process of the distinction of the knower, the knowledge and the known, are supremely trustworthy, it carries its own defects. There is no logic without this distinction of the knower, the knowledge and the known; and with this distinction, there is no eternal truth. The complete synthesis of knowledge would be a union where reason is transcended altogether, where the intellect is wholly surpassed and differences and distinctions cancelled. This is not possible as long as the seeker rests in the human consciousness. But the practical moral urge points to the existence of perfection which is unlimited in every way, and this urge is corroborated by direct intuitive experience. It is heard from such sources that the supreme Reality is free from the functions of thinking, the notion of individuality and the perception of external existence. It is all unlimited, spaceless, timeless, non-dual, pure Consciousness. It is called Superconsciousness. ; for, it is greater than the ordinary consciousness experienced in life. This does not contradict pure reason, and since reason has nothing better to say, it has to accept the trustworthy character of what is heard from those who have reached the kernel of existence. Logic may scrutinise, reason may verify, the validity of these declarations; and since they are found to be agreeable to logic and reason, and as they also ratify the practical moral urge, they have to be taken as the torch in the quest after the Truth. Pure reason takes the aspirant to the door of intuition. Intuition does not contradict reason, but surpasses it. The eye of intuition opens when the heart is purified through the practice of various spiritual disciplines, when the mind, intellect, and the senses stop their functioning. Sanjaya had this eye of intuition through the grace of Sri Vyasa. Arjuna also had the eye of intuition through the grace of Lord Krishna, and experienced Vishwarupa Darshana. Intuition is the eye of wisdom, intellect is the eye of worldly knowledge. The Brahmakara Vritti that proceeds from the pure mind, or the higher mind, pertains to intuition. In intuition, the consciousness moves upwards, towards the Self and its illumination. In intellect, the common sense moves downwards to the world of illusory objects. "However vague, vast and sentimental", says Walter Gierson in his Conclusions of Modern Science, "we cannot resist the inference that in personal intuition we have an insight into the depths of Truth unplumbed by science". In his book Rational Mysticism, Kingsland argues that, "the deepest secrets of nature, the great structural facts of the universe, are not matters of physics and chemistry, nor can they ever been demonstrated to the intellect like a proposition of Euclid. They are living facts, fatefully connected with the life of each individual, by and for himself. They are matters to be experienced rather than to be demonstrated, not by an intellectual apprehension of Truth merely, but by a living and vital contact therewith". 1. that it is direct and immediate in its operations; the language which may appropriately be used to denote it, is the language of immediate vision. 5. It is, finally, pre-eminently the faculty which assures us of the meaning and significance of things. Nor is it only a meaning and significance that it assures us of, but a divine meaning and a personal significance." For F. H. Bradley, the British philosopher, all intellectual analysis is a falsification of the real, as it breaks up its unity into a system of separate terms and relations. "The unified structure of Reality", says Bradley, "is revealed more in feeling than in thought, in the higher unity in which thought, feeling and volition are blended into a whole". The French philosopher Henri Bergson suggests intuition for intellect as the proper organ of absolute knowledge. He says we attain to awareness of reality through immediate consciousness. In his work Introduction to Metaphysics, he writes, "An absolute can only be given in an intuition". The Italian philosopher, Benedetto Croce, is of the opinion that logical knowledge takes us away from the individual, while intuitive knowledge gives us an insight into the individual. Bradley, Bergson and Croce diversely emphasize that intellect succeeds in stiffening life and binding it in concepts. "There are some", says Sir Arthur Stanley Eddington, the great English astronomer, in his work The Nature of the Physical World, "to whom the sense of a divine Presence irradiating the soul is one of the most obvious things of experience". Ritchie asks, "Can we really think of omniscience apart from omnipresence? If I knew another individual person through and through, I should be that person." Bernard Bosanquet, the English philosopher, says, "Truth is normal to mind, and error is the exception. If you can get the mind's thought pure, you must possess in it a true characterisation of reality. Its doing so is not conceptional. It is inherent." Pratt affirms in his work, Religious Consciousness, that "the mystic ecstasy is cognitive in form. It seems to reveal reality to the mystic quite as much as does his sight or hearing." "His experience is one of intuition. It is the sense of being face to face with Reality." Baruch Spinoza says, "To know the essence of things, as God does from within, we need the higher grade of knowledge - intuition." He draws a clear line of demarcation between imagination, reason and intuition. "Intuitive knowledge", Spinoza says, "does not consist in being convinced by reasons, but in an immediate union with the thing itself. It is a direct revelation of the object itself to the understanding. The highest peace of mind arises from intuitive vision." Blaise Pascal, the French philosopher and mathematician says, "reason itself concedes that there is an infinite region beyond reason." "The mind thinks in two ways", he says, "the mathematical way, and the finer way. In the latter case, we feel the Truth." Descartes' "I think therefore I am" is a reversal of "I am, therefore I think". Even an empirical philosopher like Locke concedes the reality of intuition. He says, "as for our own existence, we perceive it so plainly and so certainly, that it neither needs nor is capable of proof." In Immanuel Kant, the "I think" accompanies all representations. It is the vehicle of all concepts in general. Arthur Schopenhauer asserts that we become aware of something more than phenomenal in our inner experience. J. G. Fichte holds the view that the knowledge of the Self is due to intuition. For Dante Alighieri, intuition is the all-embracing intelligence. It is a common knowledge with all scholars of Grecian culture, that the voice of the inner man counted more for Socrates than external perception or logical reasoning. According to Plato, noesis is the highest kind of knowledge, immediate and supra-intellectual. He believed in the conversation of the soul with Itself. Aristotle speaks of the absolute Self-knowledge of God, a pure activity which knows no law and no end outside itself. Plotinus and the Neo-Platonists were convinced that logical knowledge alone is inadequate. Plato gives this faculty the designation of "recollection". He says all learning is a process akin to remembering, as all truth is at once new and old, cognition as well as recognition. Aristotle's "nous" represents the intuitive apprehension of the "first principles". He says, "How can there be a science of first principles? Their truth is evident to everyone. We know them by nous, by direct contact." There are certain lower forms of intuition; but in fact they cannot be ranked with intuition as such. The creative power of the unconscious mind is such, that sometimes the rational activity of the mind will continue below the subliminal level; it will go on far below the threshold of consciousness, very often in sleep and dream. It will yield ready forms of rational thought. Coleridge composed Kubla Khan, an originally long poem, in dream. The problem of a proper needle for the sewing machine was symbolically solved for its inventor in dream. Shelley poured out ready forms of poetry. Mathematical geniuses give ready calculation. But none of these are intuitional in the sense of the spiritual science. These activities do not permit conscious willing, except in a negligible measure. Also they do not permit encroachment by reason. But intuition as developed by the disciplines of the spiritual science, widens the scope of reason, and makes conscious willing possible in the highest degree in every direction. The important point to remember is, that the solutions for the problems of religion, philosophy and science, lie in the development of intuition as shown by the ancient sages. The goal of life which these sages indicate is Truth itself. The goal has been discerned in the clear perspective of complete knowledge, immediate and direct. The aim of life is the intuitive realisation of the Self. For, the Self is the substratum for everything, the cause for everything, and the soul for everything. Western philosophers give no definite answers to such fundamental questions as, "What is the goal of life?" and "What is the summum bonum?" "What is the supreme purpose of human life on earth?" Whatever answers they provide are in terms of the physical sciences, whose conclusions are formulated by the limitations of human mind, and on a non-metaphysical basis. By developing intuition, the spiritual East fulfils the best aspirations of the Western philosophy. Without the philosophy of intuition as it is practised in the East, the philosophy of the Western world reminds us of the helpless state of the physical science before the invention of the telescope, the microscope and the other special instruments of modern science. Before the invention of the microscope, it was not possible to know what the microbes were. Any attempt at a conjecture of the microscopic cells of life, or matter, must obviously have been a perfect failure. To philosophise before developing all the higher and latent powers of observation that are there in man cannot be really scientific, insofar as such a philosophy is infested with the errors and limitations of imperfect and undeveloped powers of perception and experience. Such a philosophising will never succeed in engaging the attention of serious men of action, and can never yield any tangible results that could take up the life of mankind, in a powerful impact of upward movement. The proverb of the philosopher running after a black cat in a dark room while the cat is not therein, must continue to hold its own, unless intuition is brought to action in the lives of the philosophers. Intuition is the main method of the science of the Soul. Being essentially scientific, the spiritual science is capable of uniform application, and guarantees uniform results to the average man who trains himself in the methods laid down for the development of intuition. Intuitional experience is a settled manifestation of the essential Light, and the intrinsic dynamism, of the inner self-existent Witness Consciousness, in which the ultimate ground of all existence stands self-revealed. It determines the constant play of a plenary spiritual cognizance of the Consciousness of all existences, with the directness that belongs to a knowledge by total identity, and in the immediacy that goes with the inalienability of the oneness of one's own being with the Being of all beings. A strong spiritual disposition long accustomed to an intimate self-observation in self-awareness, to a repeated reflection upon the self-existent truths of all things, the intrinsic "why", "how", "where", "what", "when" of all existences and all phenomena, acquires a mystical penetration into the Soul of all that is, and gains a light by which we grow into the Infinite. It obtains the real Self-knowledge, accepts a temporary preoccupation with the realities of cosmic life, - views the world by the world-transcending Consciousness, sees time and space by overstepping them, looks at life from a height pinnacled in the bosom of the awareness of the absolute Awareness. It lives permanently in a state of soul, a plenary vision, in which the direct and immediate experience of the transcendent Divinity is a natural condition, a constant self-sustaining status of being. This, then is the intuitional experience to which the high spiritual intelligence of an austere dignity, uplifted beyond the constitutional fallibilities of the rational processes, the incertitudes of the intellectual findings, the instrumental utility of a metaphysically presupposed epistemology, is a shining witness. Again, of this intuitional experience, the high spiritual mind of integral insight - that proceeds by the perception of the One in the many, and the many in the One, knows by the knowledge of an identity with the object of knowing, sees with the plenitude of Self-awareness and the all-aware Consciousness, - is a grand observer and an invincible advocate. The animal part in man seeks sensations and the pleasures that arise from the disturbed, troubled and excited nerves. The higher part in man seeks the calm and peaceful light and joy of understanding. When sensations dominate, the animal part grows stronger, dominant, renders the will weak, and demands the repetition of the sense-pleasures. When understanding dominates, the divine Consciousness emerges into action, and makes of will a power, of personality a greatness, of mind a haven of peace, and of life a heaven. Close your eyes. You see nothing, the world of visible objects and persons is withdrawn from you. Close your ears, the world of hearing is lost to you. With the eyes, you cannot hear; and with the ears, you cannot see. Thus, the senses are limited in their capacity and functions. Each of our senses reveals only a fragment of the world. See the world by the mind, you have quite broad and greater pictures. Perceive the world by poetic sensibility or aesthetic feeling, you have a different experience and perception. See the world by the clairvoyant vision, the invisible things become visible. See the world through the intuitive faculty and higher powers of the inner consciousness, you will find everywhere a divine Principle and Being. The range of our perception is extended with every higher instrument of knowledge we employ. Man transcends the animal kingdom by reason of his richly endowed mental perception, and the sage is lifted as much above the ordinary human individual by reason of his intuitive perception and experience of the wonders and delights of the creative Consciousness of the infinite Godhead. Divine dynamic Gnosis, or Vedanta, is a complexus of extraordinary cognitive disciplines of the contemplative Consciousness which rend veil after veil in the self-luminous self-perception, and lead the inner being to the Light beyond all lights. Conditioned to the disciplines in the awareness of Awareness, of observing the Observer, witnessing the witnessing Self, the Vedantic intelligence is a purified radiance raised above reason, proceeding by a method deeper and higher than the introspective evidence, substituting the intellectual assurances by experiential convictions, turning the feeling of the Infinite into the experience of the Infinite. It is a perpetual gymnastic in the gnostic powers of Self-perception, Self-vision, Self-experience, that transfigure the entire field of the individual life into an expanding arena, the receding horizons of the one austere Self-seeing; seeing the Self in the Self, by the Self, the Self in all, and all in the Self; and seeking its delight in a knowledge structured above knowledge, - Vedanta, Paravidya, in a Light beyond all lights, Jyotisham Jyotih, in the Truth that transcends all truths - Satyasya Satyam. Starting with the initial procedures of continually storing the chastened mind with profound philosophical perceptions, which carry the power of stimulating into activity the native intuitions of the inner Being, - the sustained reflection upon the fundamental truths concerning the Nature and the Being of the Transcendent, the unbroken energisation of inner consciousness in a rapt contemplation, the formation of the psychosis of the Infinite, the Vedantic consciousness submits itself in the immediacy of highest spiritual experience, to the Touches of the Transcendent. Under their impact, it breaks the Infinite-psychosis, and finds its emergence into the Beyond that is the Beyond concerning which there can be no written work, much less an oral utterance, except a not easily comprehensible manual gesture, and from which there is no concession of a return.